Sophia Lu is a Fellow at the International Trade Administration Office of Legislative and Intergovernmental Affairs. She is currently an MA candidate in International Affairs at The George Washington University Elliott School of International Affairs. 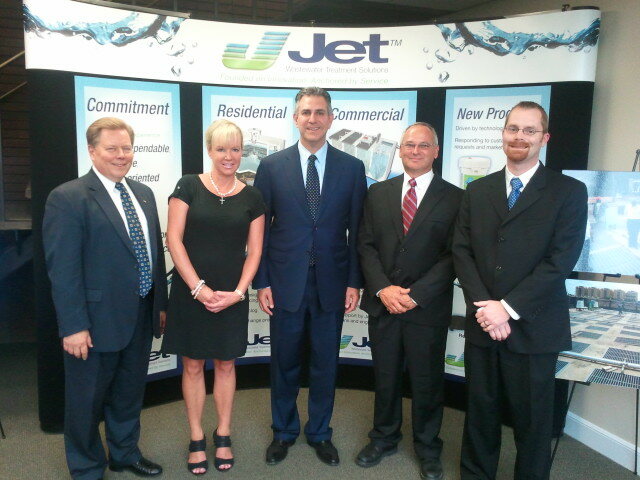 Under Secretary Francisco Sanchez (center) meets with Jet Inc.’s President Ron Swinko (far left) and other staff at their manufacturing facility in Cleveland, OH as part of the “Made in America Manufacturing Tour.” in October 2012. On October 2nd, U.S. Under Secretary of Commerce for International Trade Francisco Sánchez commenced a four-city tour of American manufacturing cities to promote the benefits of strengthening America’s manufacturers and expanding U.S. exports to create jobs. This “Made in America Manufacturing Tour” supports President Obama’s National Export Initiative (NEI), which seeks to double U.S. exports by the end of 2014. Just last year, exports supported 9.7 million American jobs, an increase of 1.2 million American jobs from 2009. Sánchez then traveled to Cleveland, Ohio and held a forum at the City Club of Cleveland on the “Resurgence of American Manufacturing”. There he also met with the Northeast Ohio District Export Council and the local business community for a roundtable discussion on the role of exporting and manufacturing in the NEI. While in Cleveland, he also toured the manufacturing facilities of Jet, Inc. and Codonics, Inc., both of which are also “E” Award winners. The following day, the Under Secretary continued his tour in Pittsburgh, Pennsylvania. He delivered a convocation lecture at Carnegie Mellon University, highlighting the importance of commercial diplomacy and how international trade drives economic growth. Under Secretary Sánchez also participated in a roundtable discussion hosted by the Western Pennsylvania District Export Council. He then met with officials and toured the manufacturing facility of Cardinal Resources, a company that has succeeded in growing its exports due to the assistance from the International Trade Administration’s (ITA) local U.S. Export Assistance Center. On October 5th, Under Secretary Sánchez made the last stop of the “Made in America Manufacturing Tour” in St. Louis, Missouri, where he met with the Missouri District Export Council and visited Ranken Technical College. He concluded the Tour with participation in a CEO roundtable event with representatives from local manufacturing firms. The reason this Manufacturing Tour is so timely is that exporting is boosting the U.S. manufacturing sector. In fact, exports in manufactured goods increased by $358 billion (39 percent) since 2009, reaching a record $1.3 trillion in 2011. And manufacturing employment has gained 532,000 jobs over the past 30 months, the strongest growth for any 30-month period since June 1989. Even as the tour concludes, the International Trade Administration won’t stop working to help support American manufacturers. To keep up to speed on our activities, follow us on Twitter at @TradeGov and @UnderSecSanchez.